This article is about the lake in Nevada. For other uses, see Pyramid Lake. The tufa formation that gives Pyramid Lake its name. Pyramid Lake is the geographic sink of the basin of the Truckee River, 40 mi (64 km) northeast of Reno, Nevada, United States. Pyramid Lake is fed by the Truckee River, which is mostly the outflow from Lake Tahoe. The Truckee River enters Pyramid Lake at its southern end. Pyramid Lake is an endorheic lake. It has no outlet, with water leaving only by evaporation, or sub-surface seepage. The lake has about 10% of the area of the Great Salt Lake, but it has about 25% more volume. The salinity is approximately 1/6 that of sea water. Although clear Lake Tahoe forms the headwaters that drain to Pyramid Lake, the Truckee River delivers more turbid waters to Pyramid Lake after traversing the steep Sierra terrain and collecting moderately high silt-loaded surface runoff. A remnant of the Pleistocene Lake Lahontan (~890 feet deep), the lake area was inhabited by the 19th-century Paiute, who fished the Tui chub and Lahontan cutthroat trout from the lake. The former is now endangered and the latter is threatened. The lake was first mapped in 1844 by John C. Frémont, the American discoverer of the lake who also gave it its English title. In the 19th century two battles were fought near the lake, major actions in the Paiute War. In the 1960s a marker was placed commemorating these battles. 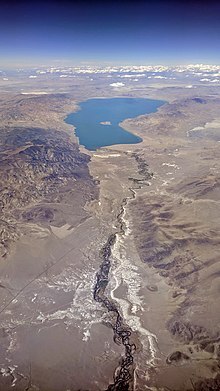 Because of water diversion beginning in 1905 by Derby Dam through Truckee Canal to Lahontan reservoir, the lake's existence was threatened, and the Paiute sued the Department of the Interior. By the mid-1970s, the lake had lost 80 feet of depth, and according to Paiute fisheries officials, the life of the lake was seriously under threat. According to documentary filmmaker John Pilger, the irrigation scheme for which water was diverted was an economic failure. 1903 – Irrigation diversion of the Truckee via the Derby Dam contributed to the decline and eventual extinction in Pyramid Lake of the Lahontan cutthroat trout, which are now stocked. 1936 – The Pyramid Lake Paiute Tribe approved their constitution and by-laws. 1987 – A water quality model was completed for the Truckee River. Pyramid Lake is located in southeastern Washoe County in western Nevada. 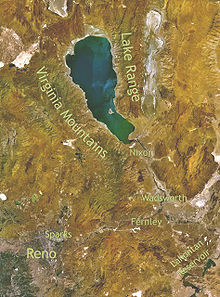 It is in an elongated intermontane basin between the Lake Range on the east, the Virginia Mountains on the west and the Pah Rah Range on the southwest. The Fox Range and the Smoke Creek Desert lie to the north. In a parallel basin to the east of the Lake Range is Winnemucca Lake, now a dry lake bed. Prior to the construction of the Derby Dam in 1905 both lake levels stood at near 3,880 ft (1,180 m). Following the dam completion the water levels dropped to 3,867 ft (1,179 m) and 3,853 ft (1,174 m) for Pyramid and Winnemucca respectively. In 1957 Pyramid Lake level was at 3,802 ft (1,159 m) and the dry Winnemucca Lake bed at 3,780 ft (1,150 m) had been dry since the 1930s. The lake is the largest remnant of ancient Lake Lahontan that covered much of northwestern Nevada at the end of the last ice age. Pyramid Lake was the deepest point in Lake Lahontan, reaching an estimated 890 feet (270 m) due to its low level relative to the surrounding basins. Sutcliffe is on the west shore of Pyramid Lake along State Route 445. Nixon is on the Truckee River to the southeast of the lake on State Route 447. The name of the lake comes from the impressive cone or pyramid shaped tufa formations found in the lake and along the shores. The largest such formation, Anaho Island, is home to a large colony of American white pelicans and is restricted for ecological reasons. Access to the Needles, another spectacular tufa formation at the northern end of the lake has also been restricted due to recent vandalism. Major fish species include the Cui-ui lakesucker, which is endemic to Pyramid Lake, the Tui chub and Lahontan cutthroat trout (the world record cutthroat trout was caught in Pyramid Lake). The former is endangered, and the latter is threatened. Both species were of critical importance to the Paiute people in pre-contact times. As they are both obligate freshwater spawners, they rely on sufficient inflow to allow them to run up the Truckee River to spawn, otherwise their eggs will not hatch. Diversion of the Truckee for irrigation at Derby Dam beginning in 1905 reduced inflow and the lake level to such an extent that stream flow is rarely sufficient for spawning. The Truckee Canal diverts water used to irrigate croplands in Fallon. The dam lacks fish ladders which prevents upstream spawning. By 1939 the Lahontan cutthroat trout (the "salmon-trout" as described by Frémont) became extinct in Pyramid Lake and its tributaries. They were replaced with hatchery trout from outside the watershed. However, in 1979 a remnant population of the original Pyramid Lake cutthroat trout was discovered in a small brook on Pilot Peak, on the Nevada/Utah border, by Dr. Robert Behnke of Colorado State University while he was looking for the Bonneville cutthroat trout, another subspecies of the cutthroat trout. The fish were tiny and in poor condition, but Behnke identified the fingerlings as the missing Pyramid Lake variety. Subsequent DNA testing of a museum specimen has shown his identification to be correct. The fish had apparently been dumped in the creek in the early 20th century. A brood stock was raised at the U.S. Fish and Wildlife Service's Lahontan National Fish Hatchery in Gardnerville, Nevada and a successful reintroduction effort was mounted by the USFWS and the Pyramid Lake Paiute Tribe. As of 2017, 24 pound Pyramid Lake Lahontan cutthroat trout are again being caught from the Lake's waters. The fish are doing very well, according to the USFWS project head Lisa Heki. The fish have also been placed in California's Fallen Leaf Lake, upstream of Pyramid Lake, and elsewhere. Fish populations are now sustained by several tribally-run fish hatcheries and state and federal agencies. The Pyramid Lake Lahontan cutthroat trout is one of the largest inland trout species in the world. The following data are for the census-designated place (CDP) of Sutcliffe, NV, located on the shore of Pyramid Lake. Because of the endangered species present and because the Lake Tahoe Basin comprises the headwaters of the Truckee River, Pyramid Lake has been the focus of several water quality investigations, the most detailed starting in the mid-1980s. Under direction of the U.S. Environmental Protection Agency, a comprehensive dynamic water quality computer model, the DSSAM Model was developed to analyze impacts of a variety of land use and wastewater management decisions throughout the 3,120-square-mile (8,100 km2) Truckee River Basin. Analytes addressed included nitrogen, reactive phosphate, total dissolved solids, dissolved oxygen and nine other parameters. Based upon use of the model, some decisions have been influenced to enhance Pyramid Lake water quality and aid the viability of Pyramid Lake biota. Salinity increased from 3.7 to 5 g/l and the pH level is about 9. Temperature ranges between near freezing (32 °F (0 °C)) to over 68 °F (20 °C). Pyramid Lake was used as a stand-in for the Sea of Galilee in the 1965 biblical film, The Greatest Story Ever Told. Also, in 1961, part of The Misfits was filmed nearby. 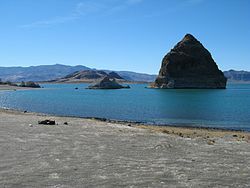 Wikimedia Commons has media related to Pyramid Lake (Nevada). ^ a b "Query Form For The United States And Its Territories". U.S. Board on Geographic Names. Retrieved 2010-05-18. ^ a b Pilger, John (1976) Pyramid Lake Is Dying (television program), UK: ATV Colour Production, currently available online, 11:50. ^ Wheeler, Sessions S. (1967). The Desert Lake: The Story of Nevada's Pyramid Lake. Caxton Press. p. 96. ISBN 9780870041396. Retrieved 2018-11-02. ^ a b DRAFT Environmental Impact Statement for the Truckee Meadows Flood Control Project Nevada, General Reevaluation Report (PDF) (Report). 1. US Army Corp of Engineers. May 2013. p. 9. Retrieved 2018-11-02. ^ "Pyramid Lake Paiute Tribe". Retrieved 2010-05-30. ^ a b Peacock, Mary M.; Hekkala, Evon R.; Kirchoff, Veronica S.; Heki, Lisa G. (2017). "Return of a giant: DNA from archival museum samples helps to identify a unique cutthroat trout lineage formerly thought to be extinct". Royal Society Open Science. Royal Society Publishing. 4 (11). doi:10.1098/rsos.17125. Retrieved 2019-02-13. ^ Hickman, Terry J.; Behnke, Robert J. (1979). "Probable Discovery of the Original Pyramid Lake Cutthroat Trout". The Progressive Fish-Culturist. 41 (3): 135–137. doi:10.1577/1548-8659(1979)41[135:PDOTOP]2.0.CO;2. Retrieved 2019-02-13. ^ "Farewell to a Legend". Colorado Trout Unlimited. Archived from the original on 2019-02-13. Retrieved 2013-11-10. ^ "Lahontan National Fish Hatchery Complex". Fish and Wildlife Service. Retrieved 2019-02-13. ^ Spahr, Robin; Region, United States. Forest Service. Intermountain (1991). Threatened, endangered, and sensitive species of the Intermountain region. U.S. Dept. of Agriculture, Forest Service, Intermountain Region. p. 86. Retrieved 12 August 2013. ^ "PYRAMID LAKE". wldb.ilec.or.jp. Retrieved 13 September 2017. ^ James Goode (1986) [First Published 1963 as "The Story of The Misfits"]. The Making of the Misfits. Limelight Editions. pp. 55, 123. ISBN 0-87910-065-6.